A little bit of hyperbole perhaps, but after the news broke earlier this week that British Airways was removing the 4500 Avios redemptions (what WAS one of the top travel hacks out there!) means that at least for me, Avios are pretty much worthless. Now, in North America only, those flights will cost 7500 Avios, the same as flights from 650-1149 miles. I can definitely see some situational value for Avios still. The flights in red previously cost 4500 Avios, but now all of those flights pictured cost 7500 Avios one way, or 15,000 Avios roundtrip, and those are my ONLY Avios options. If I want to fly ANYWHERE else in the country, it will take a connection, and therefore 15,000 Avios one-way (so a regular American award or even in some cases a STANDARD award would make more sense). It would have been nice had British Airways stopped charging by segment as part of this change. And you get a 10% rebate on your miles, so my flight will actually cost 15,750 miles, only 750 miles more than the new roundtrip Avios awards, and you get full destination flexibility, instead of only those 7 cities. Another possible option is flying Southwest. 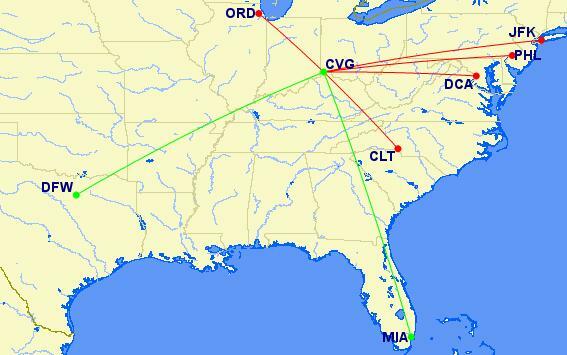 Annoyingly, Southwest does not yet fly out of Cincinnati (due in part to Delta shenanigans), but it does fly from several surrounding airports. In fact, when I was flying to Washington DC last weekend for the Family Travel for Real Life conference, I originally had booked CVG-DCA flights for 9000 Avios roundtrip. But when US Airways canceled my flight, I looked to Southwest and found a one-way nonstop ticket for only 2,924 points! That was already 35% cheaper than a 4500 Avios flight, and now it’s over 61% cheaper! If you have the Southwest Companion Pass (and I do, at least for another 2 months), it makes even MORE sense! So, while I do recognize that for some, Avios can still make sense, for me, they’re just about worthless. I have 9,000 Avios in my account (though I am expecting / hoping for a 50,000 point refund due to the cancellation of my Aer Lingus flight last month). I’ll still have the ability to transfer in from Chase, but this makes the British Airways credit card a lot less valuable! What about you? How has the Avios devaluation affected you? I bought a 4,500 Avios redemption ticket for New Years from Tokyo to Saporro last year that would have cost $370. I wouldn’t call that worthless…. Dan’s point IS that 4,500 is not worthless. Don’t understand what you’re trying to say other than you agree. Maybe you didn’t read the part that says 4,500 Avios fares are going away. If they’re so worthless, send 27,000 over to me than! I’d say worth less but not worthless. 15000 Avios round trip is still cheaper than the 20-25k miles from the domestic legacy carriers. So still the cheapest option for high-demand flights where price-linked redemptions from Southwest would cost more (and you don’t have to drive to Dayton. Still good for DFW and MIA and in other continents as you mentioned. But I’m glad I didn’t’ sign up for the 100k BA card offer and waste several months hitting the high minimum spend. Yeah, for those in AA hubs it can still be worthwhile. But I’m glad I never signed up for any BA cards. Flights to the Caribbean and Central America from AA hubs are still a great value. And even if you have to pay 7,500 instead of 4,500 to get to those hubs that can still be a great value given how relatively easy Avios are to earn. Is the implied inverse correct – that flights originating in the Carib TO the US can still be had for 4500 one-way? We used Avios on Lan in South America. 9000 points RT for a $200 ticket and 9000 points for a $400 ticket (gasp). The last was exceptional value. Right – that’s one of the places that will still give great value. It’s just more situational since most people are not always in Europe, Asia, South America, etc. Really have only become worthless for those that don’t live in a hub, don’t fly to a hub, and don’t fly outside of the US. And even for many of those people, Southwest or JetBlue were a better option than Avios before the devaluation. Cincinnati is certainly one city that would be hit hard by the devaluation because of their lack of service from other carriers, but it is pretty rare, I would think. Certainly, those people that fly transborder into Canada will lose out. I love the 15k RT redemption from PHX to PDX or SEA, where I have business almost monthly. With the low flight prices recently though, I have been just buying my tickets…you can go RT for around 210 at its best price.